I know we are all ready for spring and lighter and brighter decorating with pops of color, but, let’s face it – it’s still winter! So, I’ve decided to embrace it! I’m going to have a cozy, wintery home with a fire crackling in the fireplace and a few wintery accents here and there. 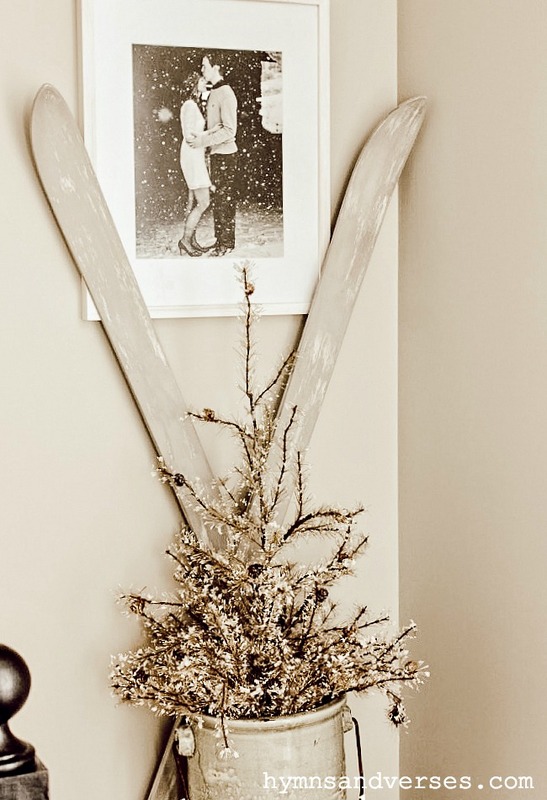 Today, I want to show you how to paint old skis and use them in your winter decor! This is an easy project that can be done in just a few hours and you can use them year after year! If you don’t have any skis that you no longer use, you can pick up a pair for very little at a thrift store or at a yard sale! I picked up this pair for just $10 and they had a lot of them. I brought them home and removed the bindings. The skis were bright pink and purple – Yikes! 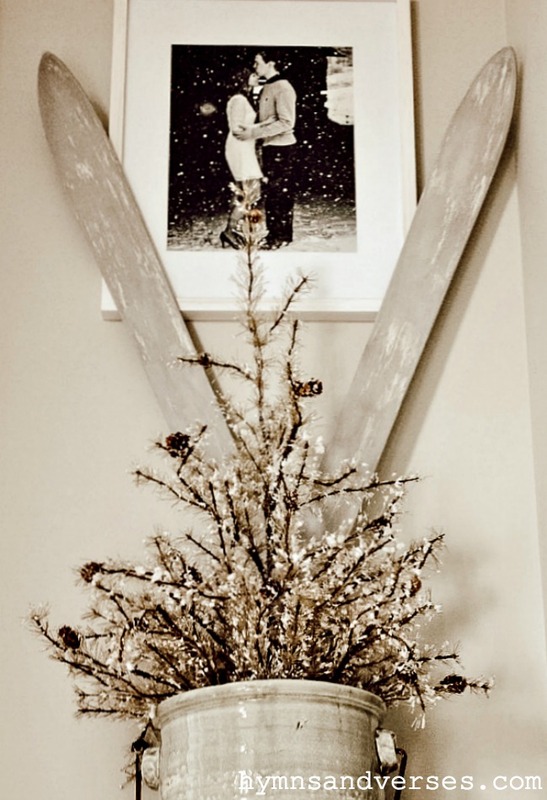 But, with a few coats of Maison Blanche La Chaux french lime paint, they look perfect in my wintery home. The beauty of Maison Blanche paint is that you don’t need to do any prep work. No sanding or roughing up your surface – even with the most slick surface, like these skis. I just painted right over that shiny pink and purple with a base coat of La Chaux Lord Anson – a cool blue shade. Then I added a coat of La Chaux Petite Chateaux – a warm gray. Finally, I dry brushed the skis with a coat of Maison Blanch Oyster – an off white. Gone is the bright pink and purple and now these skis look like they were purchased as a decor piece! I used them in a little vignette at the top of our staircase. If you are interested in trying the Maison Blanche brand of paint, you can purchase it HERE. 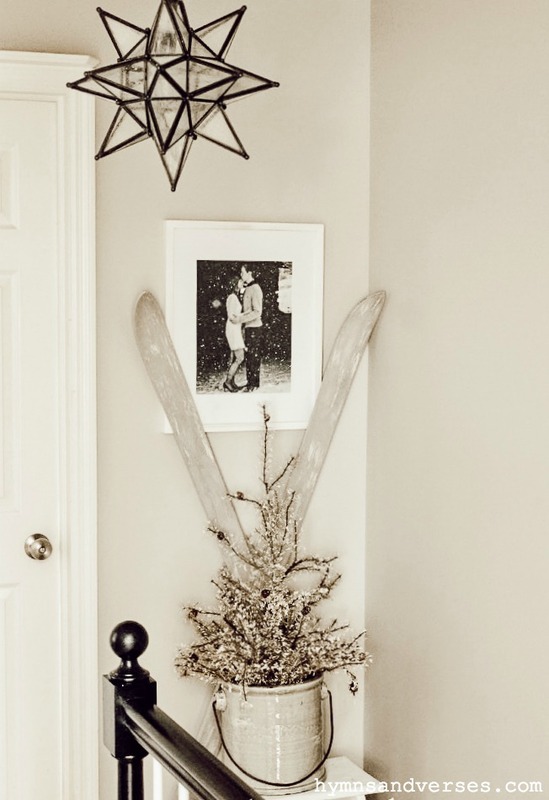 In the photo above you can see my latest Pottery Barn Outlet find that I’ve been excited to share with you – the Olivia Star Pendant. We live in an area rich in the history of the Moravian Church and each year most homes have a lighted Moravian Star hanging on their front porch. Since I first saw the Olivia Star Pendant, I knew it was the light fixture I wanted in my upstairs hallway. Pottery Barn Outlet price was just $49.99!!! I wish I could capture the patterns it casts on the ceiling and walls when lit at night – it’s just beautiful! What a great idea, Doreen! LOVE that little corner!